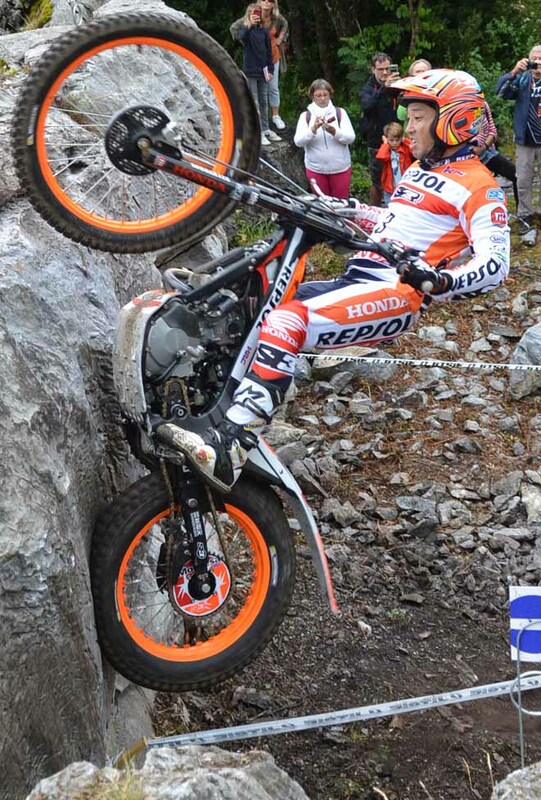 Toni Bou - Repsol Honda moved another step closer to an incredible eleventh consecutive outdoor title with a commanding performance at TrialGP Great Britain, round five of the 2017 FIM Trial World Championship at Tong near Bradford. 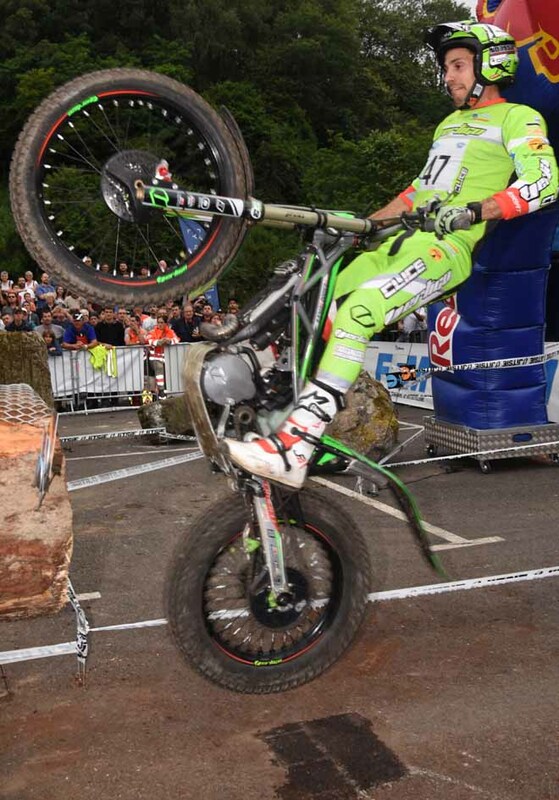 Cheered on by thousands of fans, many of whom had taken advantage of a free admission deal for ACU members, the thirty-year-old Spanish superstar claimed a record-breaking fifteenth TrialGP Great Britain win and extended his championship advantage to eighteen points with three rounds remaining. "I had a very good first lap, but made mistakes on the second lap, but I stayed clean in the final two sections for the victory," says Bou. "It's a very important weekend for me. I've extended my lead and will now go the USA with more confidence and will try to win again." Looking totally at home on the mainly natural sections comprising of imposing rock slabs, huge logs and treacherous tree roots, Bou recorded an opening lap score of just eight marks to lead home hero James Dabill - Gas Gas by eight at the halfway stage. 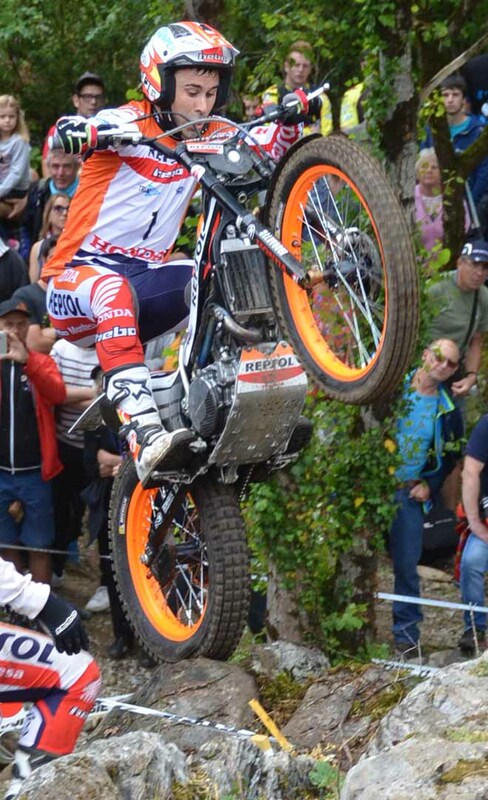 Jeroni Fajardo - Vertigo held third on seventeen, three marks ahead of fellow Spaniard Adam Raga - TRS and five clear of Takahisa Fujinami - Repsol Honda. Under a blisteringly hot sun Bou - top in yesterday's qualification - controlled the Trial from the back of the field and despite posting a second lap total of thirteen including two maximums it was still good enough for a clear-cut win. Behind him a battle raged for the remaining podium positions between Dabill, Raga and Fujigas with the final order looking too close to call before the Japanese star was able to break clear with a sensational second lap of just six marks for a total of twenty-eight. Dabill's hopes of a home podium evaporated in the fierce heat and three maximums on the final lap dropped him to a frustrating fourth, just two marks behind Raga. Fajardo matched Dabill's score of thirty-two, but lost out on a tie-break as Spanish teenager Jaime Busto - Repsol Honda failed to take his third podium in a row, ending the day a further eight marks adrift in sixth. Italy's Matteo Grattarola - Gas Gas was seventh on forty-one before a thirteen-mark gap back to Spain's Albert Cabestany - Sherco. Spaniards Jorge Casales - Beta and Miquel Gelabert - Sherco tied for ninth on seventy-two marks with Casales taking the place on a tie-break. 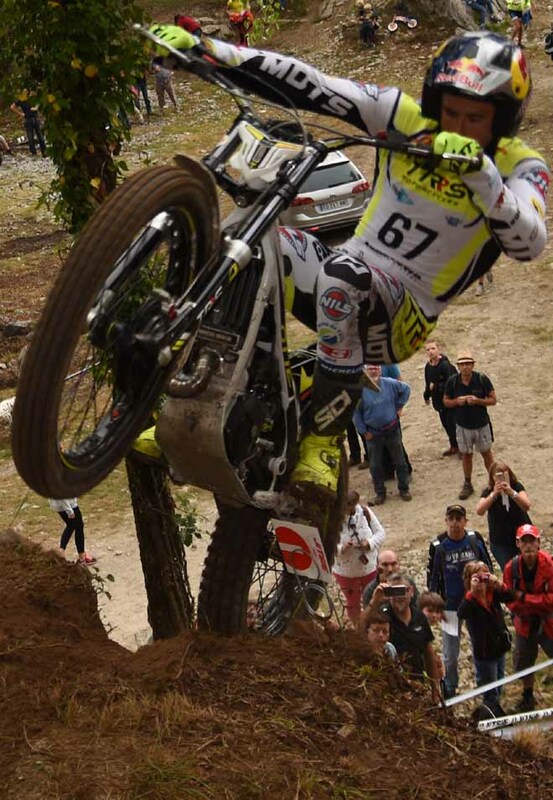 In a low-scoring, but fiercely-contested Trial2 class Spain's Francesc Moret - Hondaparted with just five marks to finish on half the total of second-placed Toby Martyn - Vertigo who, roared on by the home fans, recorded his best result of the championship to date. 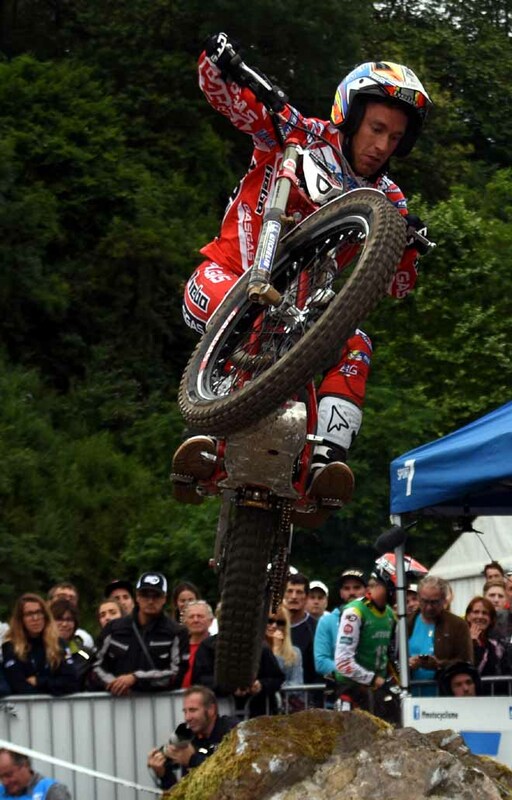 A costly maximum on the penultimate section on the final lap dropped Iwan Roberts - Beta from second to third, but the British rider still extended his championship lead. 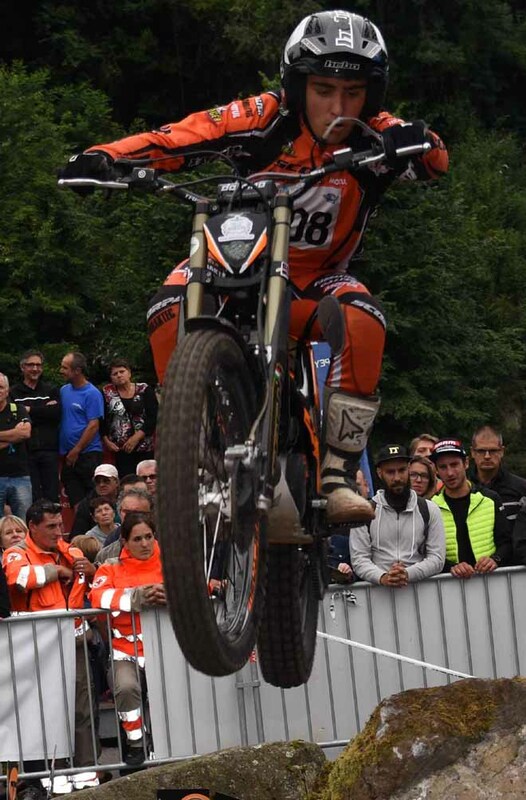 Despite leading the twenty-three-rider field away in the Trial125 class after taking a maximum in yesterday's qualification, sixteen-year-old Italian Lorenzo Gandola - Scorpa claimed his fourth win of the year to clinch the title at the end of the five-round championship. 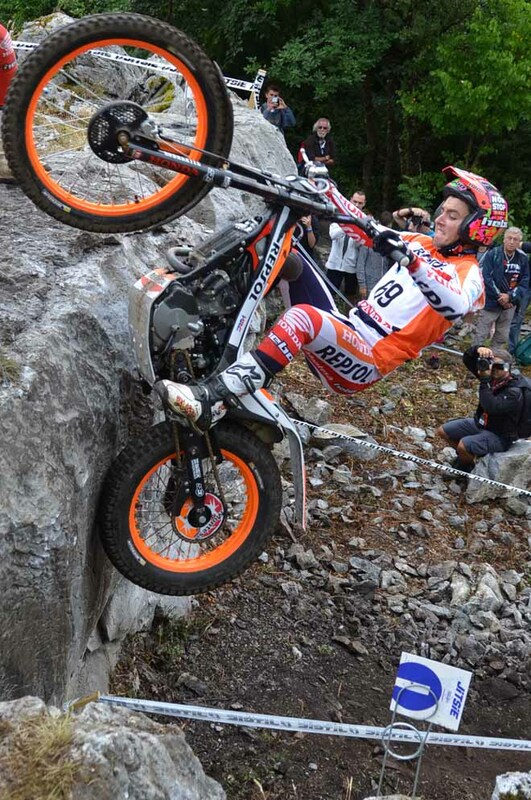 "I'm very happy to win the Trial125 championship," says Gandola. "It has been a fantastic series for me and for Scorpa." 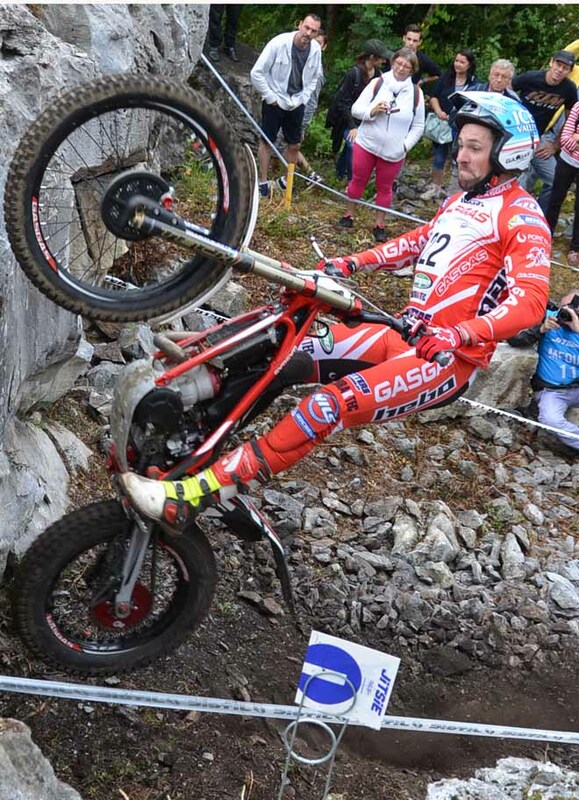 Britain's Billy Green - Beta finished just one mark behind on seventeen to secure second in the series as Fabien Poirot - Gas Gas ended the day fifth to take third in the championship on a tie-break from fellow French rider Kieran Touly - Sherco. The TrialGP series now takes a short break before heading over the Atlantic to the USA for round six later this month.